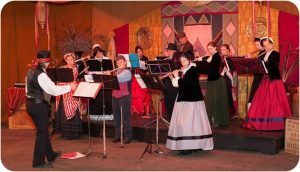 Bel Canto Flutes, based in the San Francisco Bay Area, was founded in 2000 to provide a place for adult flutists to play in an ensemble. 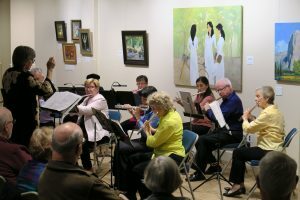 The group plays a wide variety of music spanning from arrangements of orchestral, opera and other instrumental repertoire to compositions written specifically for flute choir. Bel Canto Flutes was selected to perform at the National Flute Convention in Anaheim in 2010, and premiered two tangos written by Christopher Caliendo in honor of Gail’s birthday. In 2009, Nell Cohen wrote ‘Trees”, an original composition based on her life growing up in the Bay Area. In 2010, Christopher Caliendo wrote Ardiente and La Esgrimadora for Bel Canto Flutes to premiere at the 2010 National Flute Association convention in Anaheim. Their performance at the 2010 convention will be Bel Canto Flutes 3rd performance at an NFA convention. They are also very active performing in the San Francisco bay area including libraries, recital halls, senior centers, churches SF. City Hall among other sites. Bel Canto Flutes is open to any flutist who has a flute, the time to practice and is able to attend rehearsals. We especially invite those who may have an piccolo, alto or bass flute they’ve been wanting to play. Bel Canto Mountain View ~ New Members Welcome! Bel Canto Flutes SF ~ New Members Welcome! Is a Middle School Flute Choir designed for flutists who have at least one year playing experience. This group focuses on flute techniques, musicianship and performance practices. All flutists must provide their own flute. Please contact Gail for more information about this group. Gail Edwards Flute, Christopher Caliendo Bel Canto Flutes will perform at the NFA convention on Thursday, August 12, 2010 at noon. Bel Canto Flutes will present the world premiere of an original Tango written for Bel Canto Flutes by Christopher Caliendo. La Esgrimadora (the fencer) was especially written to celebrate the birthday of Gail Edwards. La Esgrimadoro is a tango which details the warm up exercise of a fencer. Bel Canto Flutes will also present the world premiere of Christopher Caliendo’s Ardiente (fiery). This fiery tango captures the ambition of a man for a woman he desires and combines elements of Bach, the circus, Spanish rhythms and Milonga. Christopher Caliendo, born in 1959, is the composer and publisher of over 240 works for flute. All who attend this concert and register at his site: www.christophercaliendo.com will receive a free solo flute tango download. Bel Canto Flutes will also play selections by other living American composers at their NFA convention concert. In the last couple years Bel Canto Flutes have had two other pieces written for the group, and Gail received a grant from Brannen Brothers flutemakers to perform Aurora by Richard Freeman Toole for 16 flutes. The performance at SF State’s Knuth Hall included a multi-media presentation of Aurora Borealis.